Note: Made this build in 3.3, haven't really changed anything since. Mechanics stayed exactly the same. 3.6 Update: everything pretty much the same. Some cool new crafting mods for weapons or chest added past patches. Some of the new Unique Flasks and Gloves also look worth trying out. So far, Guardians, Shaper, Red Elder deathless. Died 3 times on my Uber Atziri attempt, damage is lacking a bit and I ran out of flasks and charges. this is a little off-meta guide that is still competitive and can complete all content in the game (have not attempted Uber Elder, yet). Making dual-wield builds that only attack with the main-hand has become boring since the introduction of Shaper stat-sticks. That's why I tried to make the good old sword & board work, and I am quite satisfied with the result so far. As usual, you will find the Gem-Setup linked in the Gear pieces (mainly because I am lazy). My gear is not very good at this point, since this character is still a work in progress. For example sword, rings and amulet are easy upgrades I have to do in the near future. This build utilizes 5 Endurance Charges, that will be generated by The Red Dream/Nightmare Jewel, to mitigate the incoming physical damage. The Surrender Shield gives us around 3000 armor and 250 life gained on block. The base block chance is 71/71, but will be at 79/79 most of the time while mapping because Tempest Shield and the Ascendancy nodes "Painforged" and "Violent Retaliation". Abyssus is mandatory to make up for the dps lost by using a shield. Swap in Bloodlust for either Maim or Ruthless for maximum Warchief damage. A lot of value for the price, comparable shaper shields cost way more usually. The gems support the Reckoning ability, sometimes I gain power charges against bosses this way, sometimes not. Enduring Cry would probably be more value here. Allows us to drop a staunching flask and equip a 3rd unique flask. Also +1 Endurance Charges fits the build very well. Probably the best dps gloves in the game, especially if you have 2 decent abyss jewels. Yeah, I know its bad. Saving up for a real one atm. A rare 6-link chest with life and resists is totally fine. For Guardians/Shaper swap in Increased Critical Strikes for Increased Area. Some life, some resists, flask mods or WED would be nice to have. Life, Resists, Accuracy, Multi, Flat Physical Damage. Try to get as much of everything as you can. The Assassin's Mark on hit on the ring is most helpful, almost mandatory. If you cannot fit it into your build you probably need to run herald of ice with curse on hit for power charges. No Life Flask necessary. I dropped mine after Uber Lab (lvl 75) and haven't died since. Sin's Rebirth could also be very nice instead of either Taste of Hate or Atziri's Promise. On traditional jewels mainly look for life, attack speed and crit multi. On abyss jewels look for flat life, flat accuracy and whatever else you can get in addition to that. The Red Dream is our Endurance Charge generation. Upgrade it to The Red Nightmare as soon as possible for the extra block chance.
? for a 6-Link Astral Plate.
? for The Red Nightmare Jewel. If you have questions or suggestions feel free to contact me in this thread or in-game. Love the build, nice to find something using a shield successfully! I'm totally going to try this. 1. I tried to level a gladiator before 1h / melee and found the damage appalling? I couldn't kill any incursion bosses after around lvl 35 without running out of time and others I couldn't even kill cause their regen so was fast. How did you manage to get good damage especially while levelling? 2. Outmatch outlast I thought this was only good for dual wielding as the offhand won't work with a shield and main hand only gives you a frenzy charge? Is it not better to go for bleed, making your lacerate more effective? 3. Was lacerate ok for single target or maybe Vaal dual strike? 4. any other tips before I start this build? 1. Incursion bosses can be tanky, especially while leveling. I leveled with Ewar's Mirage and a Tabula until around level 40-45. Try to get some flat damage on your leveling uniques (Prismweave for ele, Meginord's Girdle for Phys for example). I Switched between melee skills like Frost Blades, Infernal Blow or Double Strike and all seemed fine. Just get a 4 link Warchief somewhere to help you with bosses. 2. Endurance Charges will be generated by The Red Dream Jewel that Chayula can drop (The jewel socket to the left of the skill tree). The node is very beneficial while mapping, which is what this build is very good at. It allows us to gain Frenzy Charges without using Blood Rage and gives 10% more damage and 10% more phys reduction. Lacerate has a flat 25% bleed chance which is enough for when we need the extra damage from it. 3. Lacerate did everything for me so far, except Uber Elder. Vaal Double Strike is of course a lot of extra dps if you can fit it in somewhere. Feel free to test different Skills and Gem Setups. 4. Dual wield while leveling. Take general damage nodes first, crit and block later. Tabula and a 4-link Warchief should carry you until maps. Ok sweet, I'll get a belt and see if I can get some other nice gear to help level. I don't have a tabula/ can't afford it in incursion so will see how I go. I may end up levelling this in standard league as I have one there + a few other rares. crafted this with 50 alteration + 1 regal is it ok to start with? How much PDPS should be fine for end game? This is great to start with. For endgame you want a lot of attack speed and a lot of crit, since there's much added damage from abyssus and jewellery/abyss jewels. I would aim for 2 APS, 7.0 crit and 300+ pdps for endgame. I am using a 270 Dps foil with 1.92 APS myself and it's totally fine, just not optimal. What are the mtx setting you were using? 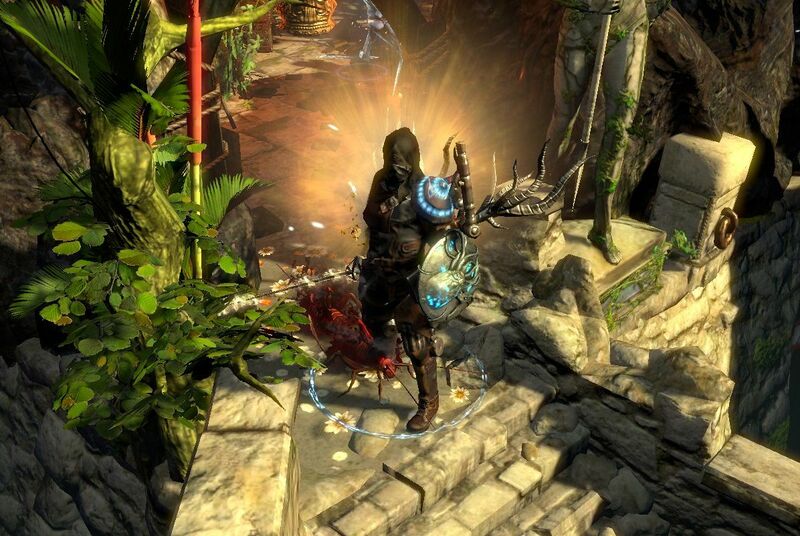 Legacy Character Effect, Gloom Herald of Ash, Stormcaller Body Armour, Seeker Hood, Seeker Boots, Neck Scarf, Demon King Wings and I think it's also Legacy Weapon Effect. The Shield is a Great Old One's Ward Skin Transfer. I'm playing this build in the Incursion Flashback (non-HC). Its very durable, mobile and does a lot of damage. Thanks for the great build! Just checked back on this build. Should still work just as fine in Delve.